​Made by the Yanagi Instrument Company in Tokyo in 1984. I don't know much about Yanagi or the 8A, but it's a large, heavy, and sturdy quality instrument. The dial is 6.75 inches across. I'm not sure, but It seems that the Yanagi Type 8 is temperature compensated while the Type 8A is both temperature and acceleration compensated. Some are designed to be mounted flush on a bulkhead or wall while others, like this one, require a circular penetration in the wall. Local pressure only, can't be set to sea level pressure because the adjustment screw does not have sufficient range for my 720 foot elevation above sea level. I bought it from the ship breakers in India. It's a precision instrument in good condition and works well. Calibration adjustments are smooth and precise. 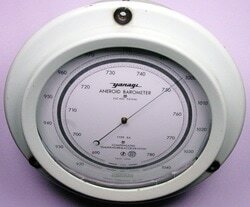 I think it's the best aneroid barometer I own.